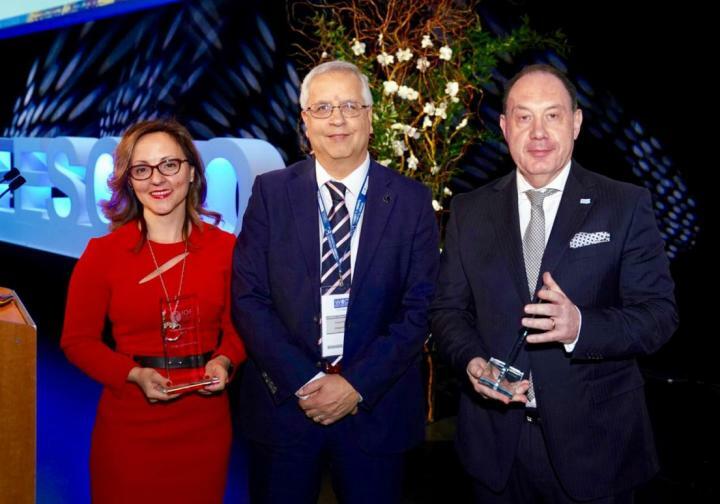 The presentations took place on April 5, 2019 at a special ceremony during the World Congress on Osteoporosis, Osteoarthritis and Musculoskeletal Diseases, which took place from April 4-7 in Paris, France. Radmila Matijevic is Assistant Professor, Medical Faculty, University of Novi Sad, and the Rehabilitation Unit Clinical Lead at the Orthopedic and Traumatology Clinic, Clinical Centre of Vojvodina, Novi Sad, Serbia. As the IOF representative of the Association of Sports Traumatology and Arthroscopy of Serbia (ASTAS), she has collaborated closely with IOF since 2014. Dr Matijevic has organized more than ten international conferences with the aim of raising awareness of osteoporosis while focusing on the key IOF objectives to prevent, diagnose and treat osteoporosis. She serves as a mentor for students’ final exams at the Medical Faculty and has published several research papers and co-authored chapters in medical books. She has developed and implemented a database required to store and extract DXA patient data and is working on a regional project on sarcopenia. As well, Dr Matijevic has worked on developing a FRAX model for Serbia, has been responsible for the SarQol translation into Serbian, and has worked tirelessly to introduce national and regional health policy makers to the importance of Fracture Liaison Services for secondary fracture prevention.